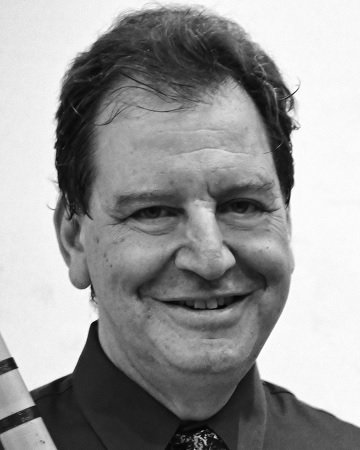 James Nyoraku Schlefer, shakuhachi and composer, is a Grand Master of the shakuhachi and one of only a handful of non-Japanese artists to have achieved this rank. He received the Grand Master certificate in 2001, and his second Shi-Han certificate in 2008, from the Mujuan Dojo in Kyoto. He has performed at Carnegie Hall, Lincoln Center, the Kennedy Center, Tanglewood and BAM, as well as multiple venues across the country and in Japan, Indonesia, Brazil and Europe. In February 2014, Concertonet.com gave him the accolade of "America's finest Shakuhachi player". Mr. Schlefer has composed multiple chamber and orchestral works combining Japanese and Western instruments as well as numerous pieces solely for traditional Japanese instruments. Orchestra of the Swan, Kyo-Shin-An Arts, the Sartori Ensemble, SONOS Chamber Orchestra, Dancing in the Streets and PearsonWidrig DanceTheater have commissioned him works, and his chamber works have been performed by the Arianna, Cassatt, Ciompi, Colorado, and Voxare String Quartets, Ensemble Epomeo and Duo Yumeno, among others. Mr. Schlefer is the Artistic Director of Kyo-Shin-An Arts; teaches shakuhachi at Columbia University and Western and World music courses at New York City Technical College (CUNY); and performs and lectures at colleges and universities throughout the United States.